Learn more about how helicopters can benefit your agricultural operation in Idaho. In Idaho, aerial applications for agricultural spraying guarantee crop quality and success and is a cost-effective alternative to ground treatments. By enabling farmers to reach remote and rugged terrains consistently for complete coverage with limited environmental impact, aerial applications provide next generation solutions to your current agricultural needs. Helicopters can be transported by truck directly to the spray sites and chemicals for aerial application treatments can be mixed and loaded directly on the nurse/platform trucks. Aerial applications in Idaho often use smaller aircraft with large load capacity like the Robinson R44 and BELL 47, which come equipped with DGPS to ensure precision, to cover large areas and save on fuel costs. FairLifts schedules aerial application solutions for the agricultural industry in Idaho, working with farmers and growers to provide crop surveys, line inspections, and frost prevention. A global global network of certified pilots ensures accurate and timely aerial applications. Agriculture is an indispensable part of Idaho’s economy. 20% of the states annual revenues are generated by agriculture and food processing. Agricultural products in the states are valued at nearly $8 billion. Most known for its potatoes, Idaho is the number one producer in the US, contributing to 32% of the nation's production. With nearly 25,000 farms and ranches spread over 11.8 million acres, the state produces more than 185 agricultural products, ranking in the the top ten in the US in 30 of the products it cultivates. Aerial application in Idaho is invaluable as spraying allows farms to efficiently and productively treat and protect large areas quickly and accurately. 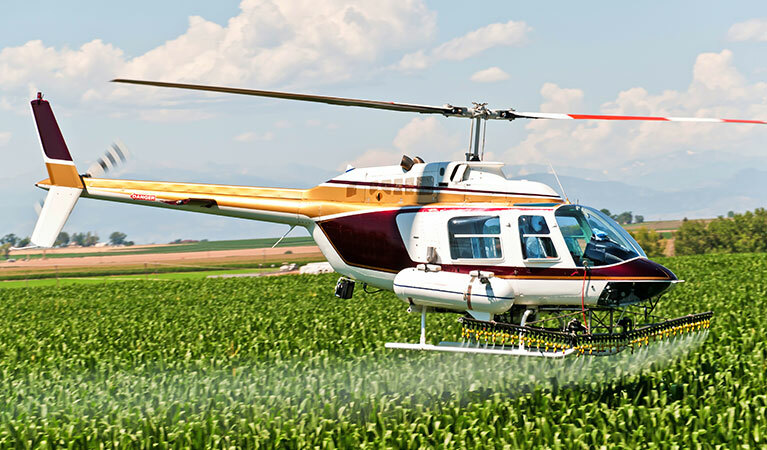 Helicopters are used to spray, treat and protect cash crops, such as, potatoes, hay, wheat, sugar beets, barley, beans, apples, peppermint and corn. A global network of helicopter operators provides an array aerial applications, such as crop dusting, topdressing, fertilizing, watering or hydroseeding. 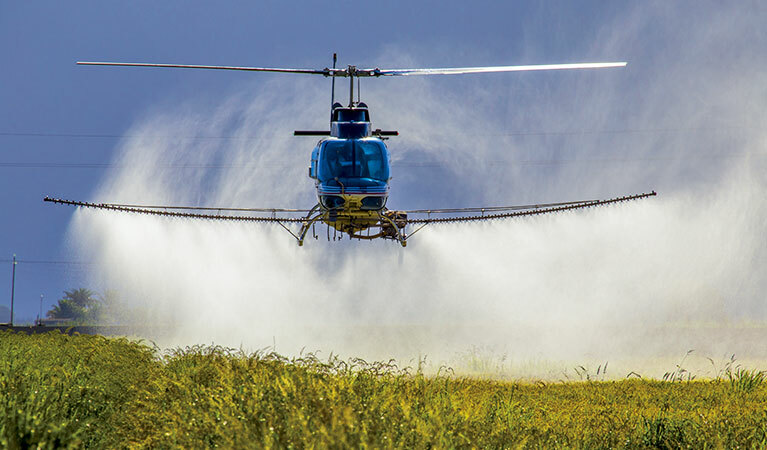 FAA-certified pilots are trained to mix and spray fungicide and crop protection products and execute aerial applications of fertilizer and hydroseeding. 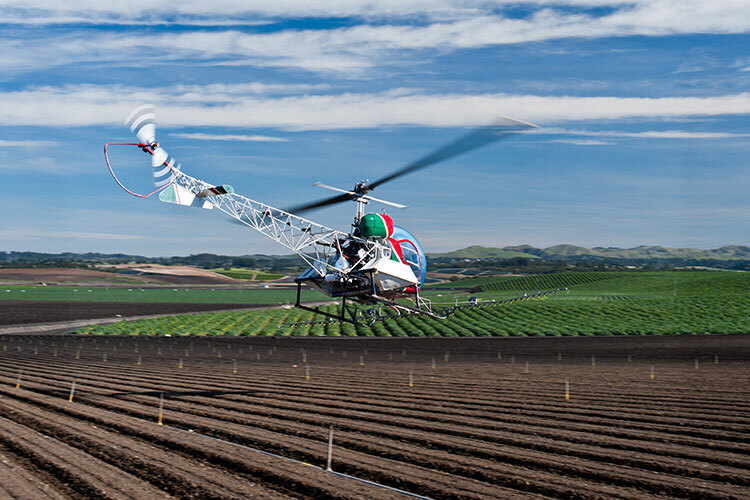 Via an expert network of helicopter operators mosquito and pest control is professionally facilitated, which prevents crop damage and lost revenue. FAA-certified pilots are trained to limit pesticide drift and spray drift and carry out adulticide and larvicide applications that ensure crops are safe and healthy. Helicopter operators provide aerial applications of herbicides that guarantee protection from noxious weeds and brush encroachments. FAA-certified pilots are trained to access remote and rugged terrains, targeting these areas precisely and consistently. Service providers facilitate consistent aerial applications of frost prevention and treatment solutions that protect crops year-round. FAA-certified pilots are available for periodic treatments of extensive agricultural areas to prevent crop damage due to weather. Experts are standing by to get you a fast quote for your agricultural job in Idaho! FairLifts works with the most professional and experienced pilots and operators working in the agricultural aviation industry. Each of our agents is well-versed in assisting farmers in producing higher and better quality yields in Idaho and can assist you in your own growth. Simply contact us seven days a week to discuss environmentally and neighborly crop dusting and spraying this next growing season.